4me2realize. One Life, One Tool, Take Charge. : How do you achieve balance without joining the circus? How do you achieve balance without joining the circus? Life balance is a often used phrase these days as we struggle to juggle life’s demands while walking the work/life balance tightrope. Sometimes it seems just another unachievable concept to tease and stress you! 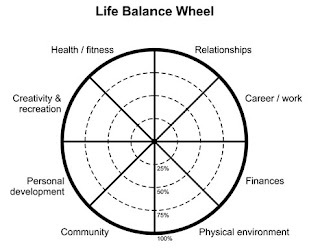 Life balance is often measured using the wheel. The exercise involves dividing your life into categories and scoring your level of satisfaction in each category. Like in the wheel below.... then you find out, is your wheel balanced or wonky? The theory is that a balanced wheel is where all areas of your life are scored evenly, and that a wonky wheel suggests areas of correction. This can be useful if you are aiming for a balanced wheel! But it can also be rather arbitrary, subjective and not so helpful. In my opinion, it misses the point! What if you are a professional swimmer? Then Health and Fitness category, by necessity, would be maybe 75% of your life balance and many other things would score lowly, because this is what you must do to achieve excellence! You have to focus on what you want to achieve. This isn’t a wonky wheel or a life out of balance, this is a life designed around achievement of specific goals. The point is not getting a balanced life, but first deciding what you want and then balancing your life, actions and decisions to achieve what you want. Rather than getting stressed about balance, it is much better to decide on what you want and then balance your life toward the achievement of these goals. This can be a huge revelation and reducer of stress. The same applies to a woman who has made her priority to be a stay-at-home mum. Her Life Balance will be overwhelmingly weighted towards looking after the children and the home. Her career/work category is going to score low and there is nothing wrong with that if that is what she wants. If it’s not what she wants, then it’s time to reorganise. 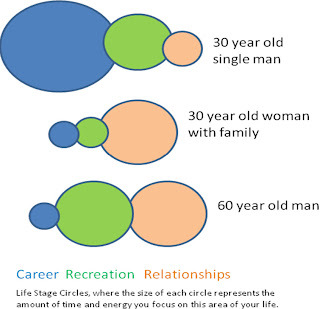 Thee circles represent the time and energy three people in very different circumstances would spend on their career, recreation and relationships. The time they allocate is affected by Life stages and their own aspirations, not a subjective and arbitrary notion of Life Balance. You see, how you run your life is entirely up to you and where you are at in your life and what you are trying to achieve. When you use 4me2realise, we take the guesswork out of Life Balance. As you journal, especially against your goals and projects, you note how much time you dedicated to this. At any point you can see how much time you have spent on a project, on a big goal and in any Life Balance category you care to create. 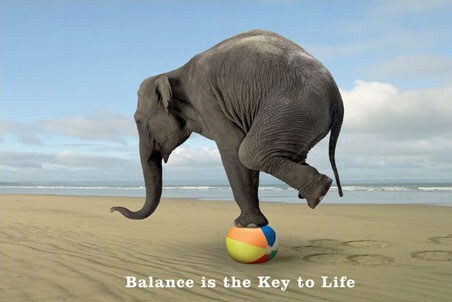 In this way you can assess and decide if your life is unbalanced or perfectly balanced to achieve your goals. If your goal is to improve your finances yet you consistently spend most of your time in health and reaction, well it’s time to get real! 4me2realize doesn’t tell you what to do, but it very clearly helps you see what you are doing and get alignment with what you want.